lots of blooms | Our Footprints…..
Before I say anything else, please take a look at that hydrangea bush…its owner must have one serious green thumb! And don’t worry, the picture is not deceiving you. 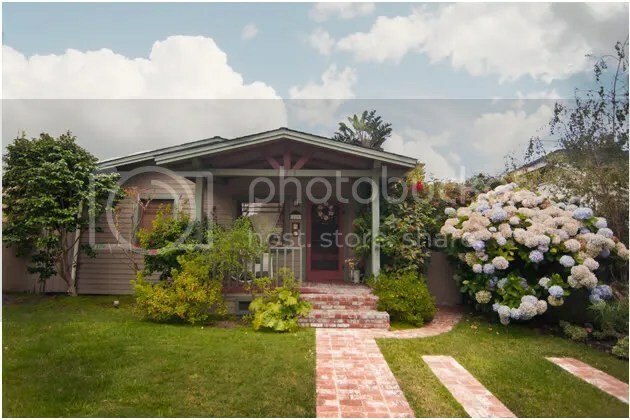 The bush is as big as the house, has as many blooms as the entire LA Flower Mart, and by my calculation if the owner was to sell each bloom for the going rate that bush is worth $400! Until, I have a yard that consists of more than my three potted plants, I will be enjoying this seasons hydrangea blooms only through my pictures. *Travis McConnell, if you are reading this, picking strawberries from the “neighbors” would also fall under this category.